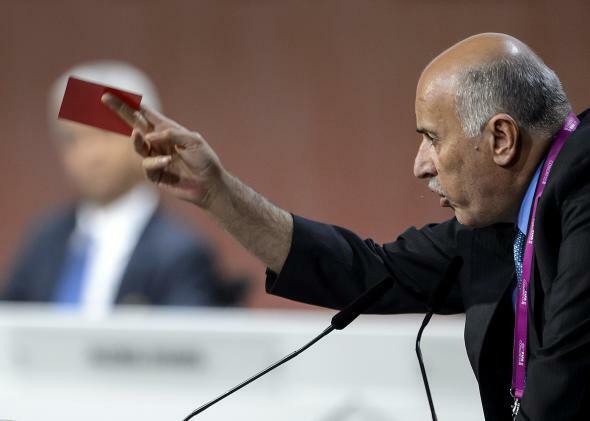 President of the Palestinian Football Association Jibril Rajoub shows a red card as he speaks during the 65th FIFA Congress on May 29, 2015. If not for the U.S. Justice Department’s surprise intervention earlier this week, the biggest story at today’s FIFA World Congress Meeting would probably have been the Palestinian Football Association’s motion to have Israel suspended from the organization. In the end, the Palestinian withdrew their proposal at the last moment and 90 percent of FIFA members voted for a compromise that allows Israel to stay. The original motion was part of the recent Palestinian campaign to “internationalize the struggle” by bringing grievances against Israel into international forums. This has also included the ongoing campaign to seek recognition at the United Nations and joining the International Criminal Court to push for an investigation of alleged Israeli war crimes. In the case of FIFA, the Palestinians complained of restrictions on the movement of Palestinian teams, the detention a of Palestinian players and officials at checkpoints, the notorious racism of fans of the Israeli team Beitar Jerusalem, and the presence of teams from Israeli settlements on occupied Palestinian territory. The movement took on extra symbolic weight after last year’s Gaza war, as Palestinian player Iyad Abu Gharqoud argued in the New York Times this week. In July, eight soccer fans who had gathered to watch the World Cup in a café were killed by an Israeli missile and a few days later, a group of boys playing the game were killed by an airstrike on a Gaza beach. Israeli football authorities counter that they have no control over military checkpoints and point out that there are Arab players on Israel’s national team. As for racist fans, if FIFA started suspending members for that, it would have to kick out most of Europe. The Palestinian complaints had been on the FIFA agenda in 2013 and 2014, but this year, the PFA seemed determined to press for a vote on the issue, citing the precedents of apartheid-era South Africa and Slobodan Milosevic’s Yugoslavia, both of which were suspended from the organization. Embattled FIFA President Sepp Blatter was strongly opposed to expelling Israel and had been campaigning against the move, but after the events earlier this week, Israeli soccer officials feared he would sell them out in order to secure the support of Middle Eastern countries against his rival, Jordan’s Prince Ali Bin al-Hussein. Israeli Prime Minister Benjamin Netanyahu weighed in earlier this morning saying that the proposed vote “is not because of something we did or didn’t do” but “stems from the opposition to our right to our own state.” He said expelling Israel would lead to the organization’s collapse. This morning’s proceedings were dramatic. In addition to a probably unrelated bomb threat that caused a brief evacuation, pro-Palestinian protesters interrupted the meeting waving red cards at Blatter. Shortly before the vote was planned to take place, PFA chief Jibril Rajoub announced he was withdrawing his proposal, giving an emotional speech saying he looks “forward to the day in which Palestinians, like many others, are enjoying the benefits of the game.” Rajoub said he had received threats and “might be dead in a year” but also thanked those who lobbied him to withdraw his motion, singling out German Chancellor Angela Merkel. The members then voted overwhelmingly in favor of an amended version of the proposal that allowed Israel to stay but called for the creation of a committee to investigate issue including the movement of players and the settler teams. The vote was followed by what sounds like an extremely uncomfortable handshake between Rajoub and Israeli Football Association chief Ofer Eini. In addition to all the lobbying, it seems as if the corruption scandal enveloping FIFA may have taken some of the wind out of the Palestinian campaign. With estimates that up to 4,000 workers will die in preparation for the 2022 Word Cup, it’s hard to take FIFA too seriously as an arbiter of morality and human rights, and the sight of its senior officials being led away in handcuffs didn’t exactly help its credibility.